We will visit Zvenigorod - a small town in Moscow suburbs founded in 12th century. The town is an hour drive from Moscow. 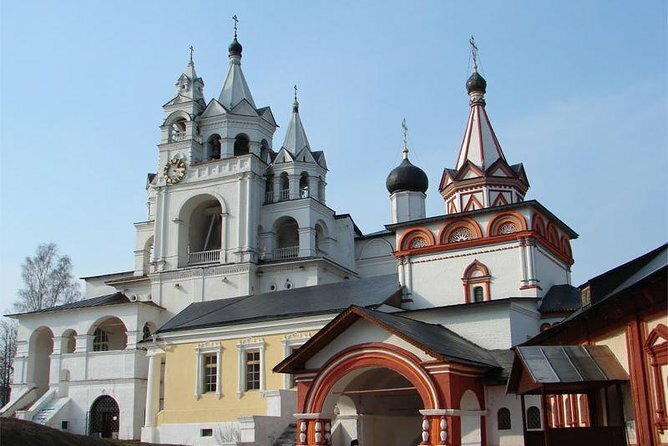 We will visit Savvino-Storozhevsky monastery - a spectacular ensamble, oldest church of which was built in 1398. It's one of the most beautiful architecturally significant monasteries, situated in a truly picturesque spot - a hill overlooking Moscow river. We will also take a walk along the central Zvenigorod street - it's tiny street with stylish wooden houses where we can have coffee in a coffee shop visited by Russian writer Gogol, it has also nice souvenir shops you can visit and there are places to buy food made in the monastery - special honey, teas etc. After visiting the monastery if the group wants we can have lunch in the spectacular local restaurant called Prichal (Boat Pier) - it's a very beautiful place with really good russian food and low prices, located near the river, and it actually has a great view on the pier and a few boats. We will drive back to the city along Rublevskoe shosse - the famous area near Moscow with most expensive houses in the city.